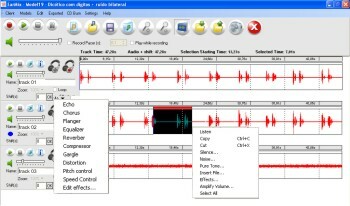 EarMix is a software conceived to help the Audiologist and the SLP to stimulate the development of auditory skills such as vigilance (sustained attention), auditory performance with competing acoustic signals, auditory closure and the performance with degraded acoustic signals, interhemispheric transfer by binaural integration and separation (divided and selective attention), frequency discrimination, temporal gap detection, thus allowing the creation of monaural and binaural strategies that are customized for the needs of each patient. EarMix offers a great number of use possibilities, both in diagnostic tests and in therapeutic activities, as well as the creation of audio CDs for home training. - Allows the recording of several stimuli to be used as monaural or binaural ways, as well as importation of WAV and MP3 files. - The patient himself may participate in the elaboration of the strategies through the recording of words /sentences / texts to be used in speech-in-noise stimulation activities. - The recorded files may be edited with several effects, thus creating acoustically distorted stimuli for auditory closure stimulation. - It is possible to control independently the intensity for each ear, besides the use of several tools that facilitate the edition of the different audio tracks created for each project. - With the addition of pure tons, it is possible to create strategies for the gap perception between two stimuli, as well as the creation of frequency and duration patterns sequences. - Possibility of white noise insertion with ipsi or contralateral options and controlling its relative intensity, considering the main stimulus. - Metronome available to facilitate the recording of strategies with rhythm. - The activities created may be exported and recorded in audio CDs for the patient/s home training. - Samples of models with clinical application strategies are included in the product to facilitate the beginning of the therapeutic use of the software. To create monaural or binaural auditory training activities, the professional may use the samples of models available in the software or create strategies with his own recordings, which permit an infinite combination of projects. The recording of each file is simple and direct. 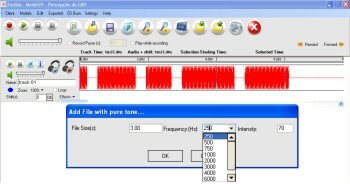 The volume command and the direction of the reproduction to the left or right ear may be chosen clicking the icon at the side of the recorded signal. This option may be changed as many times as necessary. 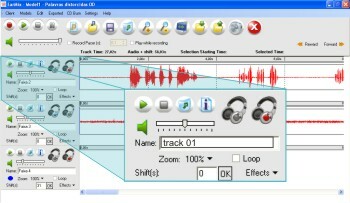 EarMix has tools for the edition of audio signals (listen, cut, copy, paste, insert silence, insert noise, clear and zoom). To distort the acoustic signal, in order to stimulate the auditory closure skill of the patient, the professional may select and adjust eight different types of effects. Functions as Dislocate, Loop and Metronome facilitate the creation of the strategies for the auditory training.